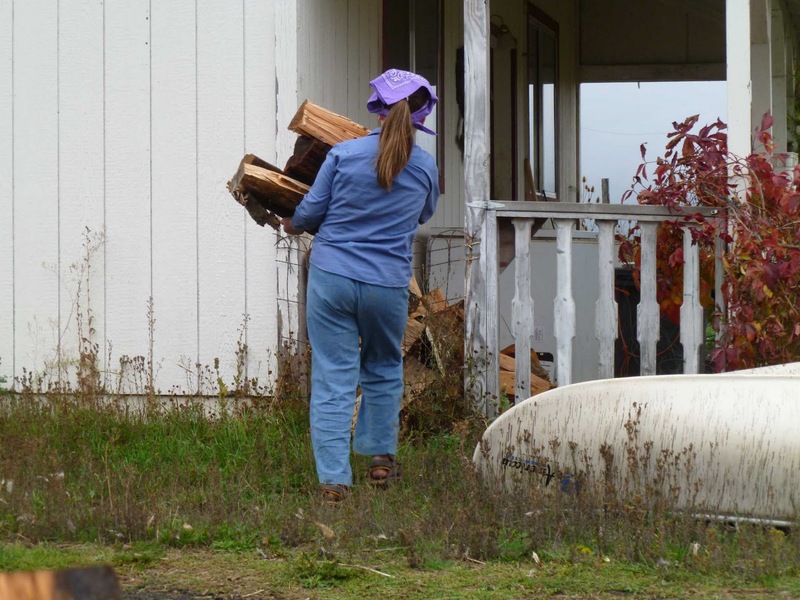 One of the neglected chores we've been meaning to get to is splitting firewood. 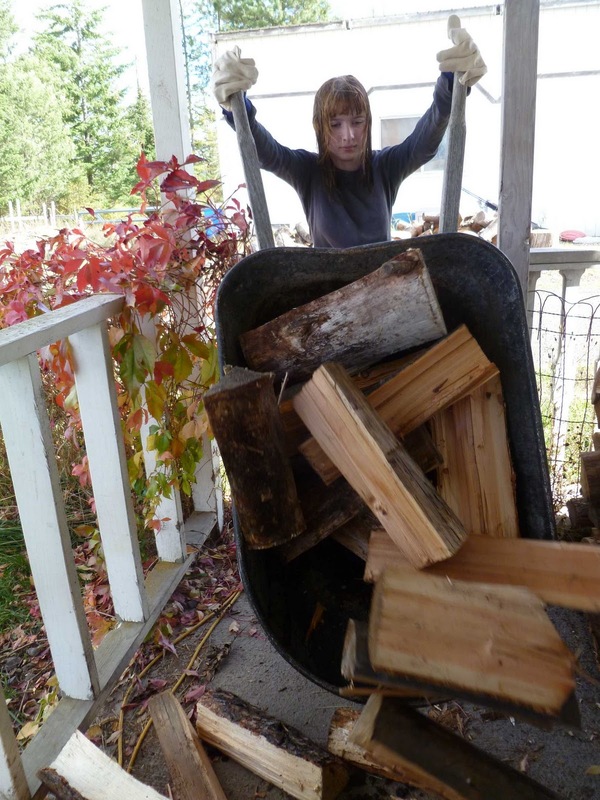 As you may or may not know, we heat our home entirely with wood heat, so firewood is a critical aspect of getting ready for a long Idaho winter. We have quite a pile of unsplit rounds in the driveway. Not enough to last the winter, of course, but it's a start. 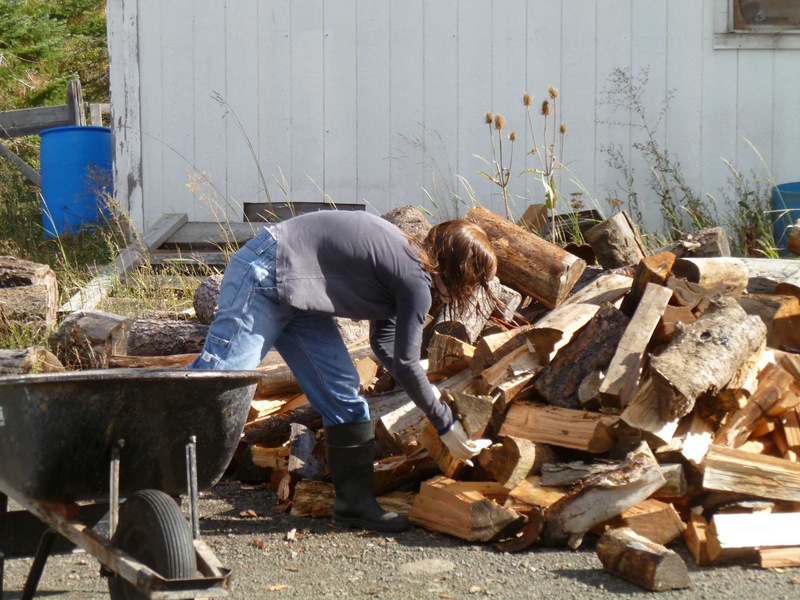 Over the summer we didn't need to heat the house; but with a nip in the air, it was time to get some wood split. Sunday afternoon while the tankards were drying, we hauled out the wood splitter and fired it up. 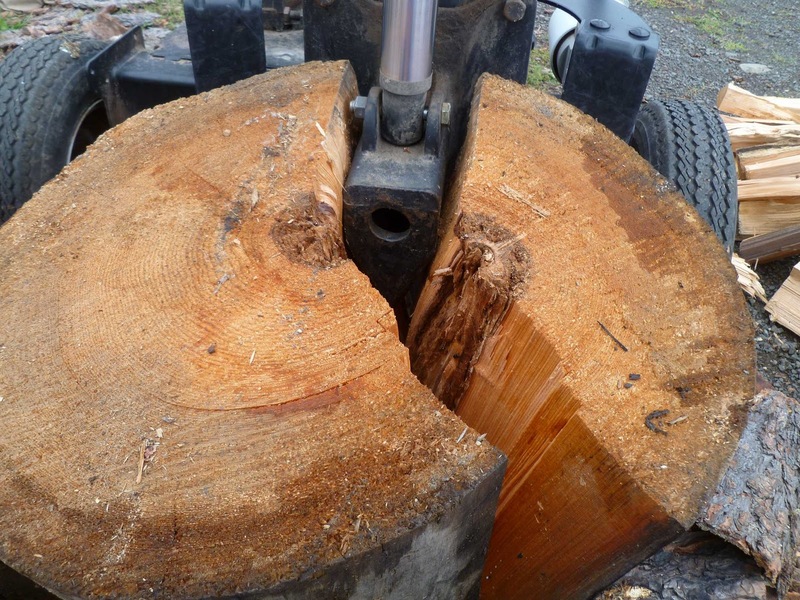 We often split by hand, but when we have a lot to split and not much time in which to do it, the log splitter is the way to go. While I settled in to split wood, Don took some tools and repaired a fence where our snarky teenage calves were regularly getting out. Some of the rounds were nearly two feet across, so we're thankful for the splitter which makes short work of them. While I split, Younger Daughter started piling the wood on the front porch. 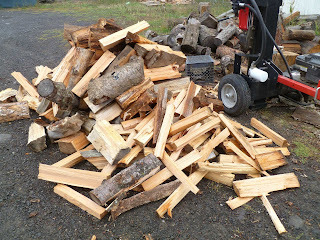 This is how much wood I split before I ran out of gas. 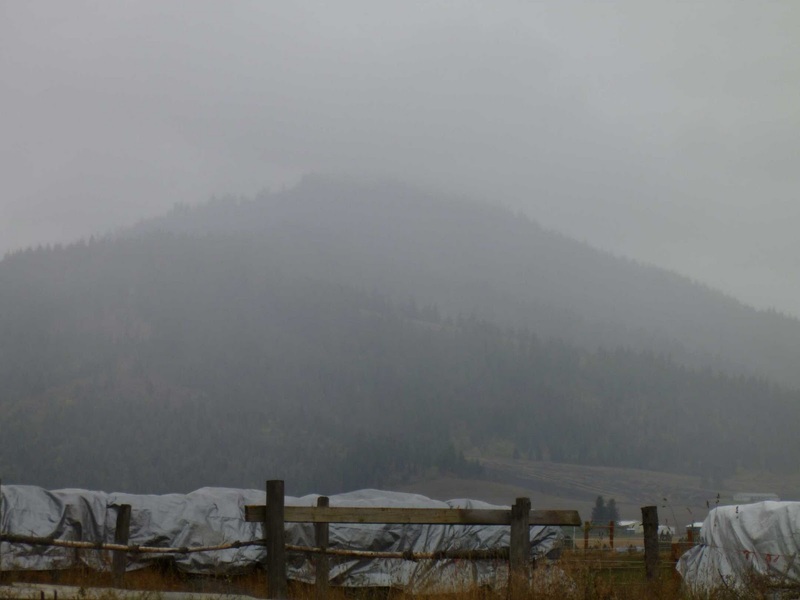 We were racing an incoming squall. 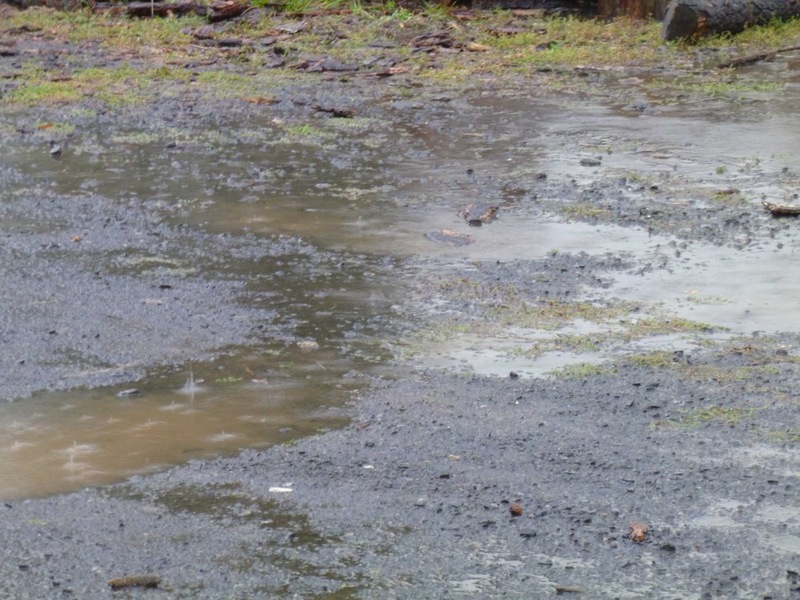 The squall won. I managed to get a plastic crate over the splitter's engine, but that was it. No worries, the wood will dry. ...and carted it to the porch. 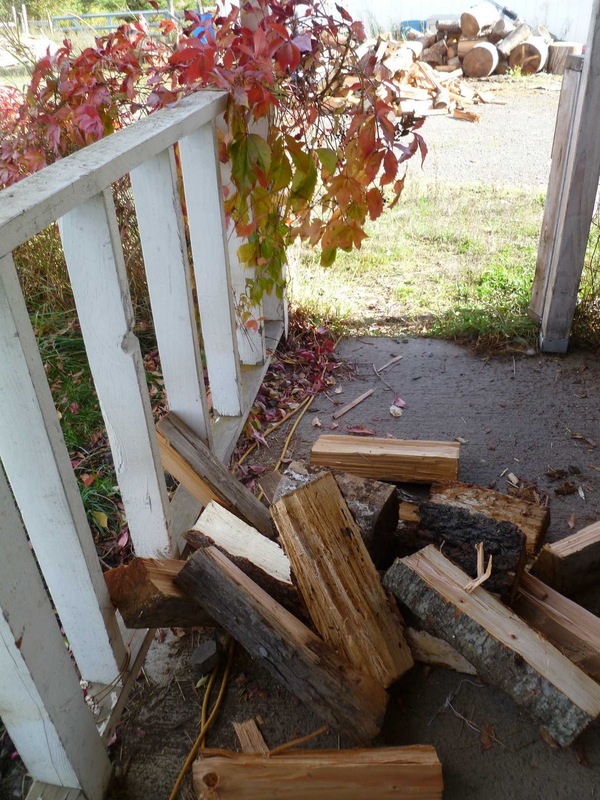 ...with overflow on the other side of the door (kindling is the pile on the right). 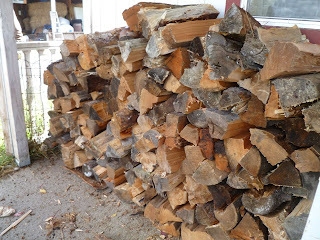 This wood will only last us about a month or so, assuming the weather gets chilly enough to keep the stove going most of the day. We have a lot more wood hauling to do! Ah, wood splitting. Reminds me of the days when my former house was heated only by a small wood stove. (The house was only 860 sq. ft. so a small stove was perfect for it.) I used to get old power poles from the utility company. They cut them into 16" lengths for me and I hauled them home and split them by hand. Fortunately, the poles were cedar and split easily. Have you considered contacting the local phone company or electric company for old poles? The treated butts should be avoided, and the nails and staples should be removed before splitting and burning, but old poles make a pretty good source of firewood if you can get them for free. 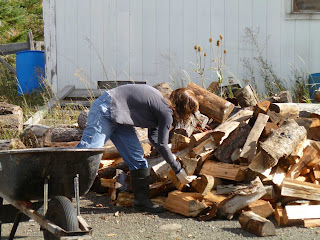 Oddly enough, I sometimes miss the job of splitting wood. It's good, honest work and pays off when their flames warm both the house and the heart. Good job getting that lot split and in. What splitter are you using? I think perhaps you might do better splitting your wood earlier in the year, rather than at the end of the summer though. 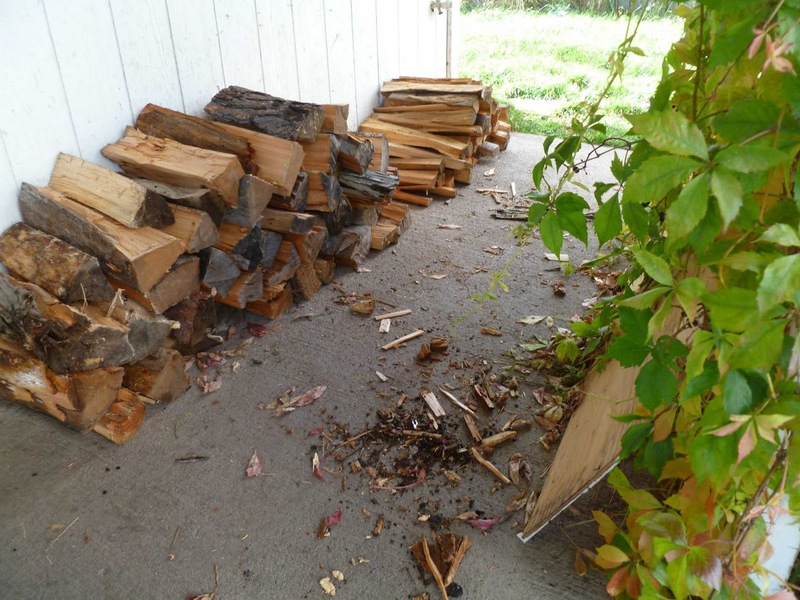 It seasons much faster if it is split down first, and will burn much more cleanly in your stove or fireplace. 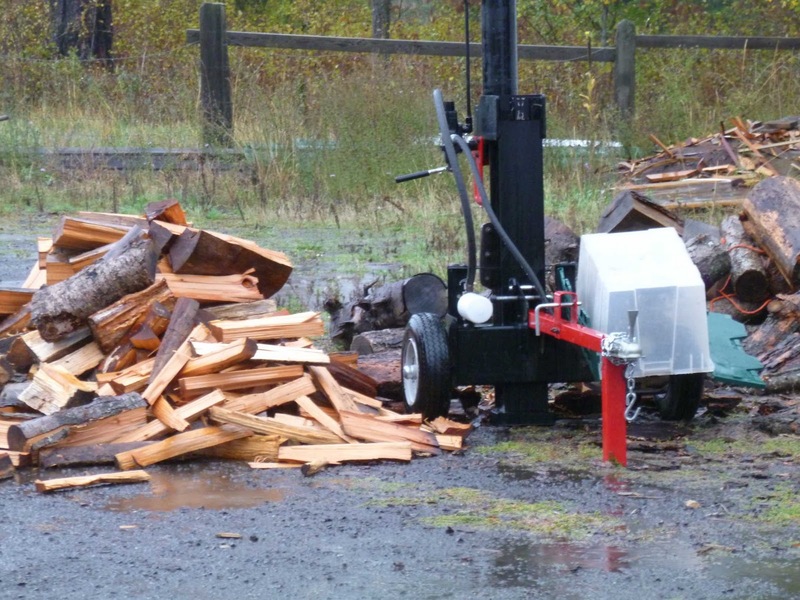 Gotta love a log splitter. We split ours the first weekend in June, before it got too unbearably hot here. It's been drying so it should be good to go if it ever gets cold. We got lucky and got a free HUGE oak an old guy the next neighborhood over had felled, then didn't have the steam to do anything more. We offered to take it off, and he agreed. FOR FREE! We are happy, looking at our wood pile. 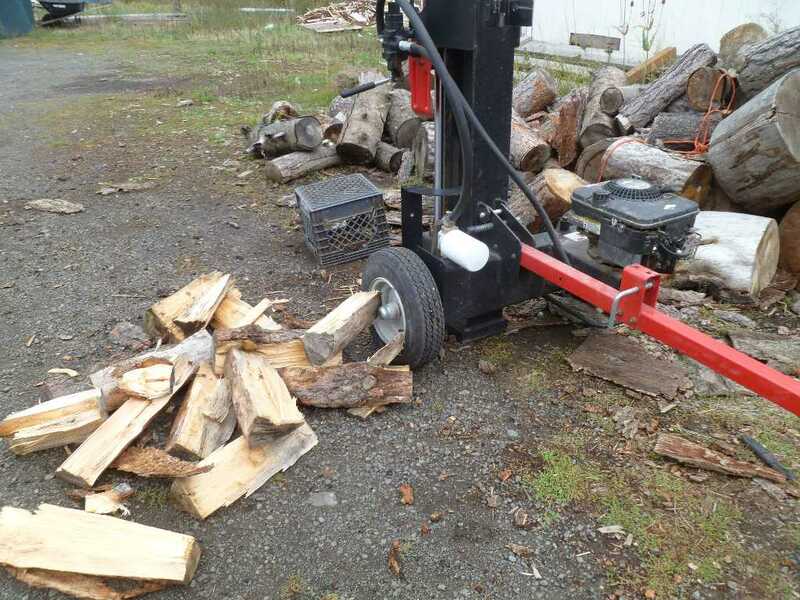 I love log splitters, sadly I need a new one this year. Splitting wood early may allow better drying but if you have to split wood by hand and it isn't an easily split variety (I am thinking cherry, burr oak, black gum etc) it is best to split it on the coldest day you can. Or at least that has been my experience and I burn alot of wood starting about December. I used to have a litte house(my first property that I owned). I still occasionally dream about that little place. It was both heaven and hell. I heated it with a wood burner although it had a gas fired stove when I took possession of the place. 82-83 was a record setting cold a-s year around here. Those were good/bad times. split alot of wood over the years but never had a power splitter...in "93, east of the mississippi river we had a major major ice storm..we were lucky to have a woodburning fireplace that could warm the whole house and a propane gas grill for cooking. this lasted for three weeks and at the end of the weather and ice i had all i could take of hauling firewood in...it was a dangerous job due to the ice. from that point on i had my fireplace converted to propane and then bought a propane stove/oven for the kitchen as well. 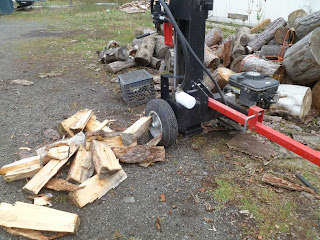 now i won't have to worry about breaking a hip trying to haul in wood and i don't have to cut or split wood..i do walk the woods and farm here and collect all fallen branches etc...and we use it for our harvest bonfire at the end of every october..some of it i save for making "twig" furniture. Heh...we had our wood in by the middle of September...it would have been sooner than that, but you know how the rains were here this spring...every weekend we were going to go out in May and June, it was raining. Ptooey. We finally invested in a second chain saw for me...a Stihl easy-start...let me tell you, it's worth the extra 50 bucks for the easy start! I had started out with the regular pull start, and even my husband couldn't start the stupid thing! Now we can get in a cord in about 3-4 hours, instead of 6 to 8. Takes 9 cords to heat our house in the winter(stupid cathedral ceilings!). We simply can't afford the propane, though we do have a propane back up for those really cold days. 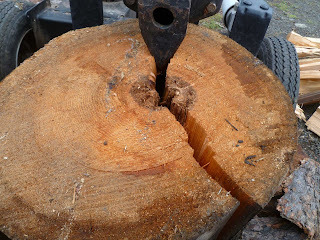 Thankfully, our landlady's brother lets us borrow his homemade splitter, cause some of the wood we pick up isn't as dry as we'd like. 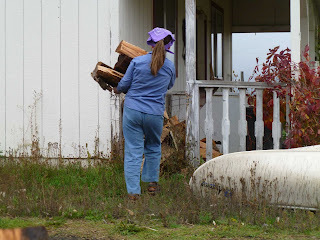 I wanted to echo PioneerPreppy's comment about splitting wood when it's cold outside. It truly makes a difference. And don't forget to make sure the wood is seasoned at least 6-9 months for optimal burning.